Nearly two years ago, the Spend Matters team birthed the inaugural set of SolutionMap rankings unto the world. This week, the latest quarterly update was released, showing how procurement software providers stack up against one another. So this is a good time to explore how SolutionMap came into being and explain how it works. In the end, it certainly took a village. The team decided the first three SolutionMap categories to tackle should comprise an end-to-end view of the P2P area (e-procurement, invoice-to-pay, procure-to-pay). We’re now up to 12 categories, including end-to-end suite views and contingent workforce/services, with more on the horizon. Analyst Ratings + Customer Ratings + Persona Views = How do the rankings pan out? Did Q1 procurement tech news affect SolutionMap? Two newsworthy developments involving participating solution providers transpired during the first quarter of this year. However, the Spend Matters analyst team has already embarked on a holistic refresh of all participating providers for the Q2 2019 SolutionMap release — due out this summer — taking an even more granular and exhaustive approach of evaluating vendor capabilities. 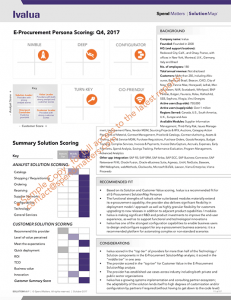 Which Q1 2019 SolutionMap providers are the best performers? For now, let’s shine a spotlight on a few notable Value Leaders within the Q1 SolutionMap. 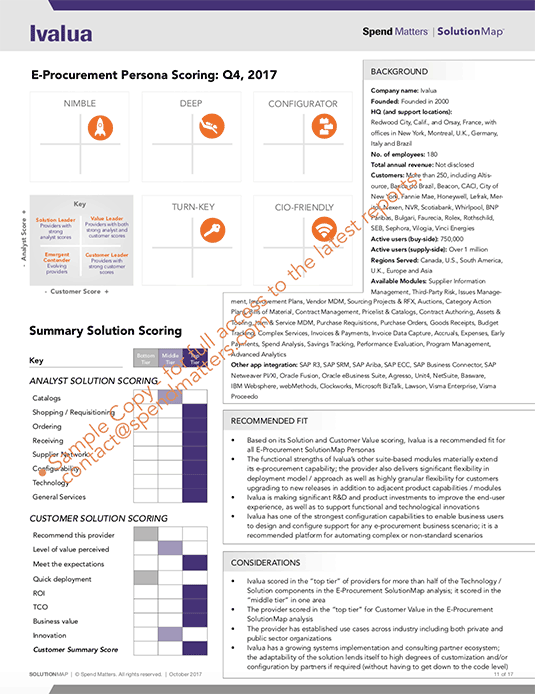 In terms of the suite providers, the usual suspects that play across the entire source-to-pay (S2P) spectrum still scored strongly in multiple categories (with only minor changes in customer scoring compared to Q4 2018, in certain cases) — Coupa, SAP Ariba and Ivalua held on to their status as the heavies to be reckoned with. In the pool of P2P suite providers, Vroozi managed to achieve Value Leader status (in at least one persona) in all three constituent SolutionMap categories: E-Procurement, Invoice-to-Pay and Procure-to-Pay. Basware and BirchStreet are two other P2P suite providers that generally ranked well in Q1. Beeline, one of the few CW/S technology players with integrated offerings across the Temp Staffing, Contract Services/SOW and Independent Contract Worker (ICW) SolutionMap categories, ranked highly across those categories, especially Temp Staffing and SOW. As for the best-of-breed solution providers, Agiloft and SirionLabs ranked well across all personas in the Contract Lifecycle Management category. AnyData Solutions and Sievo ranked well across personas in Spend Analytics, and HICX had a nice showing in Supplier Relationship Management and Risk in the Q1 SolutionMap. Note: Within a single solution category (e.g. Spend Analytics), a provider may rank as a Value Leader in one persona but not in another, based on persona weightings and other factors. To see all of the above in visual format by persona, view the free rankings here.